The rather mild Georgia winter is almost over as we make plans to de-winterize the motorhome and hit the road with some new adventures. I figured it would be a good time to update everyone and share the excitement of a new season of outdoor fun. 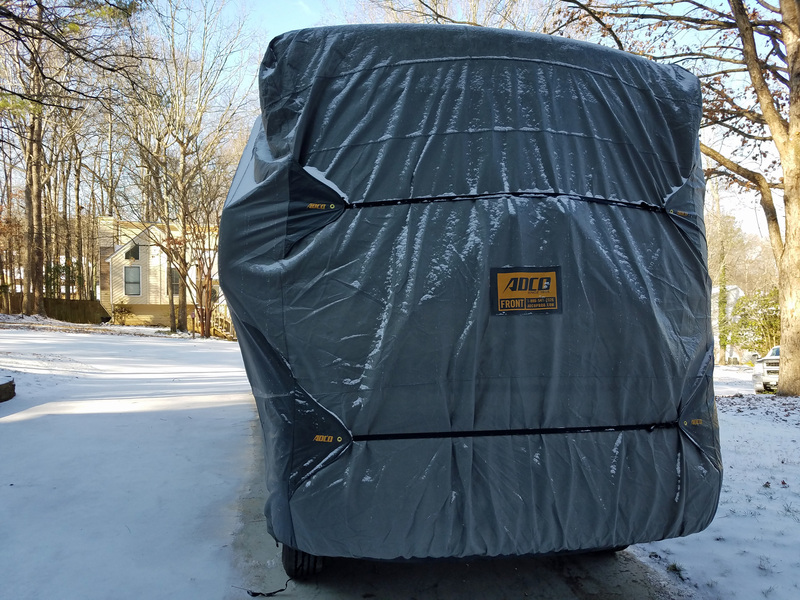 The motorhome got a cover for the winter. First task was to correct the problem of our motorhome’s gimpy back leg, so to speak. 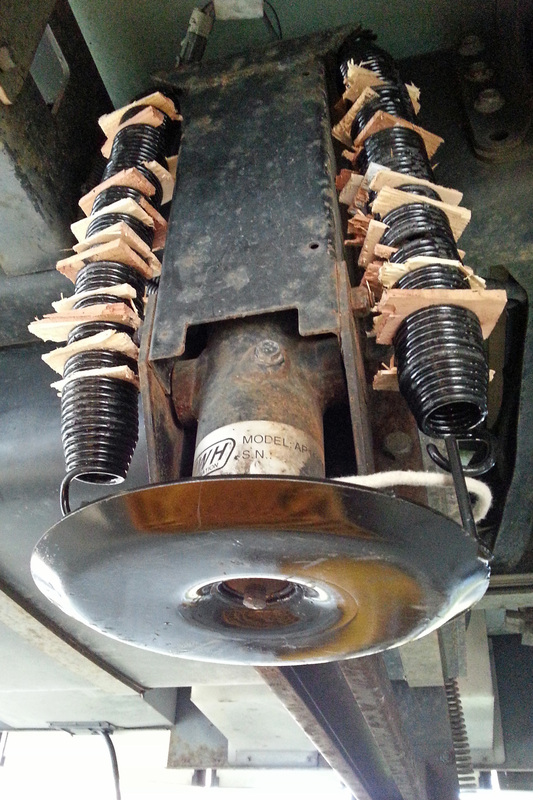 The leveling jack for which I replaced the springs and foot would not extend and it was more than my feeble brain could figure out, so we uncovered the van, drove it to our local RV shop and within days they made the repair and had everything back to order. It seems a solenoid needed replacement. Yippee – back to “four on the floor” when needed. The leveling jack that needed replacement springs and foot. The wood wedges were needed to expand the springs enough to install. Back in the driveway I ran the generator a bit, connected the shore line for electricity to charge the house batteries and did a bumper-to-bumper diagnostic. The dashboard 12v power outlet (formerly known as cigarette lighter) had not worked since I replaced the radio, so this was a needed repair. Simple, right? Not so fast, buddy. The nice thing about the Winnebago dash is that it is hinged, so you can swing it up to have access to all the gauges and connections. But you also have to have enough flexibility in your wired connections not to unplug things when you do that. The short wire on the 12v socket needed to be a longer one, so I replaced a longer negative wire and connected to a grounding screw in the frame. Power to the positive was harder, since I couldn’t find a handy splice or available connector in the wiring nearby. It must have been spliced into the old radio power supply. The remedy for this was to run a new wire from the fuse box way over on the left side to the outlet way over on the right side. Hmm… how to best do this? Let me remind you that I taught 6 years of technology and engineering, one unit of which was electricity and electronics – but that really doesn’t mean I have all the right wires, connectors and electrical understanding to just bang this out without thinking. A hammer, nails and lumber — that I can do. Automotive… not so much. But after a few runs to several automotive supply stores I found a nifty add-a-fuse power splitter that let me connect to the radio’s slot on the fuse panel and we had success! Radio works, power outlet works, and now we can conveniently charge the cell phones and such on the road. Yes, we do have an inverter with AC outlet for just that sort of thing, but it is above the windshield and not within reach while driving. So what’s next on our travel bucket list? We want to do some more camping in the Georgia mountains and maybe nearby Alabama and Tennessee State Parks this spring. We booked two weeks back at St. Andrews State Park, Florida in early summer, which is our time for snorkeling and paddleboarding. But the big trip late summer and fall will be out West to visit Yellowstone, Glacier and Grand Teton National Parks. We researched and planned out the trip to do a southern route to Grand Teton NP, then Yellowstone NP and on up to Glacier NP before the snow arrived. Booked the date in Yellowstone and were all set to book Glacier when … my, my, what do you know? A little ‘ol 5 minute solar eclipse was scheduled to pass along the Tetons on the very day we wanted to stay there. Booked up full — the whole county. Nothing available until weeks later. We were told by park rangers that they had been getting calls about it 5 years ago! End of days? Nah, not for us, but it did require an entire re-working of the trip. So I reversed our path to a northern route to Glacier NP first, then looping back down to Yellowstone NP and Grand Teton NP. We made the changes in reservations and filled in the gaps. On the trip out, we will camp in South Dakota in the Badlands NP and Custer State Park, checking out Mount Rushmore, Crazy Horse Memorial and the Black Hills. From there we stay in Bighorn National Forest, check out Devil’s Tower National Monument and then to Glacier, Yellowstone and Grand Teton. Lots of hiking planned and probably a rafting trip down the Snake River, too. I bought a new lens for my camera to better capture the wildlife and scenery and we are looking into buying a spotting scope for more close-up wildlife sightings (wolves maybe??). 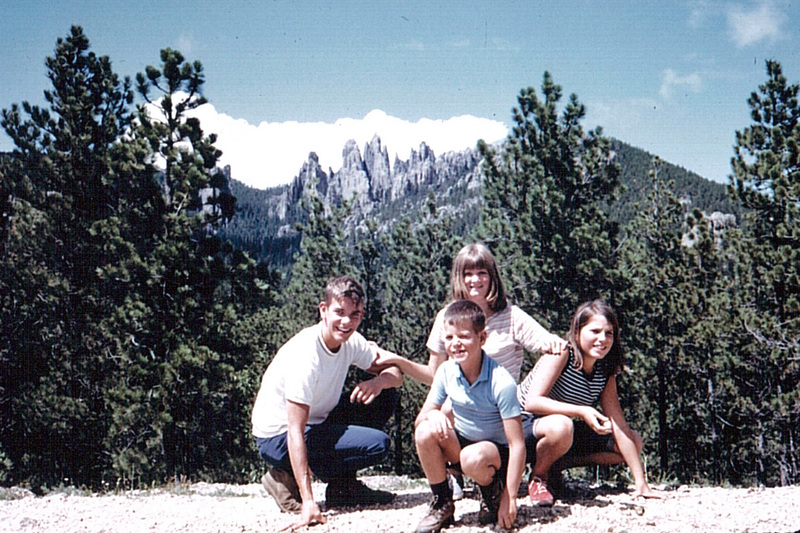 “The Great Camping Adventure of 1969,” probably in the Needles section of the Black Hills. Some of this is revisiting places my family camped in when we pulled off “The Great Camping Adventure of 1969.” Yes, during the most historic summer of the century, while hippies were hitch-hiking to Woodstock; Watts and Newark were burning from riots; Charles Manson and cult were murdering Sharon Tate and men were first landing on the moon, my family of six was packed into a Plymouth station wagon, pulling a Cox pop-up camper, speeding across the US on a 6-week grand adventure! No TV, no Internet, no cellphones or social media, just a poke-your-sister-in-the-backseat kind of entertainment. 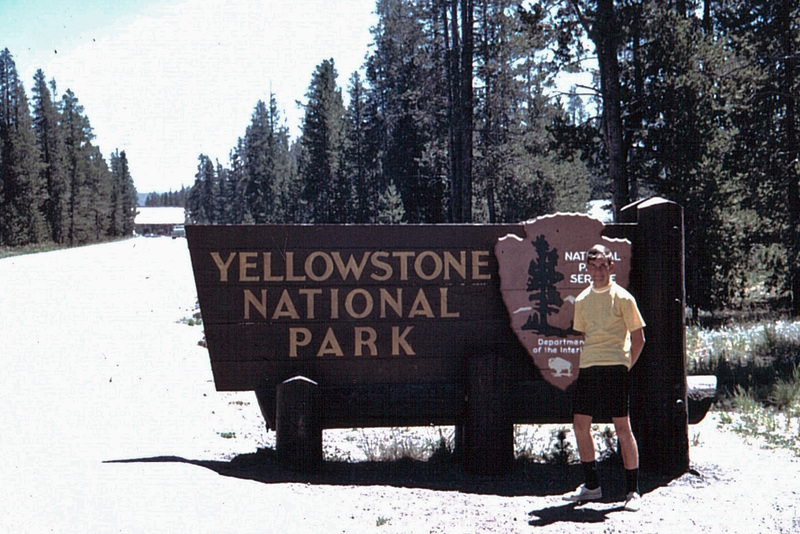 In Yellowstone we listened by car radio one night as Neil Armstrong took his first steps on the moon. Yep. Missed that one live on TV. 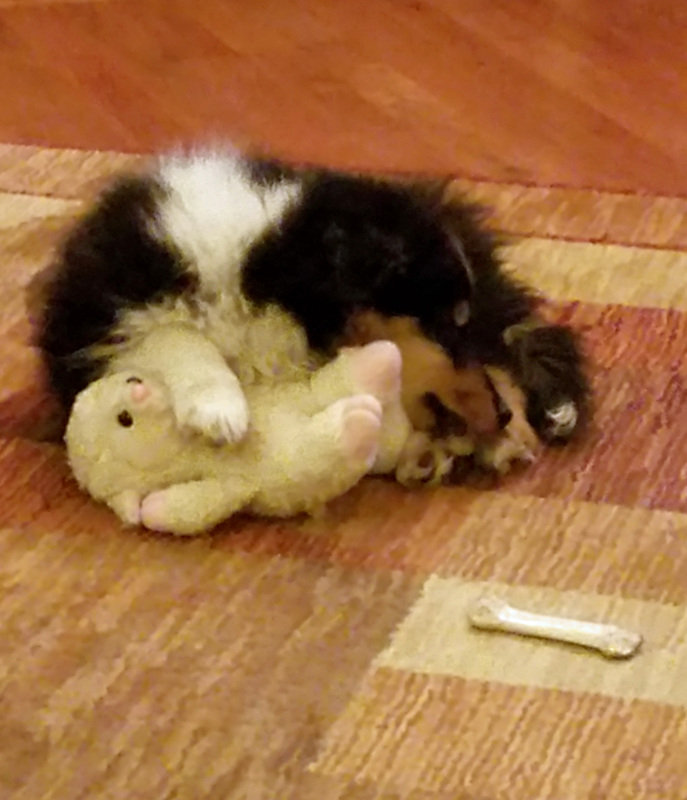 Every good Shetland Sheepdog knows how to keep a close eye on the flock. If you are a regular reader of this blog, you already know about Kodi from the postings that Merlin (our cat) has been making on his Mews page. Kodi is a few months old now and is somewhere between a toddler and a teenager, dog-wise. He loves going for walks on a leash, fetching a ball, rope knot or any of his toys, and is just learning some agility. He has made some new dog friends and visited lots of folks already. But the best part is that he will soon be joining us in the motorhome on our camping adventures. He has checked it out and it seems to work for him – although we haven’t rattled down the road with him in it yet. Benji will always be our special Adventure Dog and travels with us in spirit, now Kodi is set to learn what it is like and joins Merlin in the motorhome as we head out into the world together. 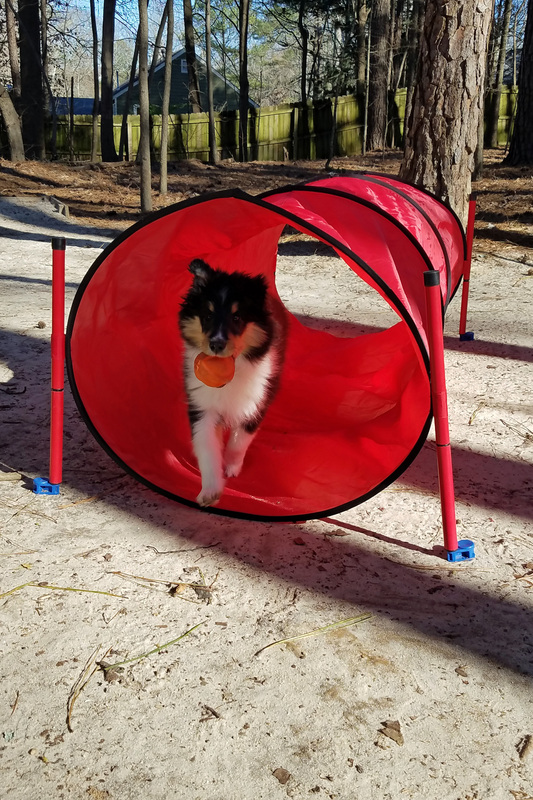 Kodi trying out the agility tunnel. So while we await the arrival of nasty yellow pollen and plan the final de-winterizing of the motorhome, we do what everyone else at this time of year does: we plan for the upcoming season of warm weather, sunshine, warm water and wild adventures. We will report back from time to time, so follow along with us! PS. Merlin says you should keep up with his Mews page, too. Hope to get to the States sometime, so will follow your travels with interest. So much to see and enjoy. Thanks for the comment.